Our Collaborative Gallery Show premiere on November 30th at SUNYIT was a huge success! 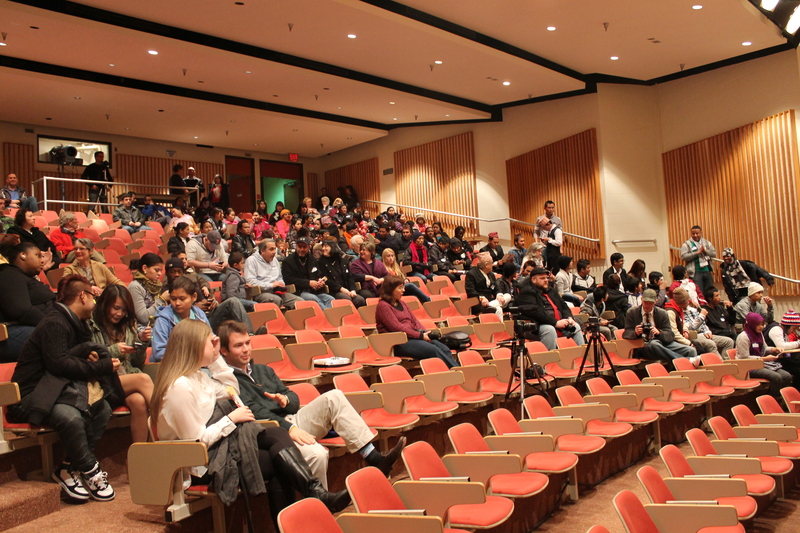 We had a great turnout, including friends, community members and many from the refugee community! Starting at 4:30pm, “Starting Over: Portraits of Refugee Life in Utica, NY” at the Gannet Gallery was finally open for viewing. We worked on this project for over eight months and it was such a relief to be able to share our work! Around 6pm, we moved down the hall to Gannet Gallery for the World Music Event. Around 7pm we introduced Utica Firefly documentary appropriately called ‘Starting Over,” produced by Geoff Storm and Ryan Miller. We are so happy and proud of how this turned out and thankful to the film’s participants. Starting Over from Utica Firefly on Vimeo. Check out bonus footage from the documentary on our website! We ended the night with live stories from the audience. We had many community and refugee members participate and it was a moving and enlightening experience for many. Thank you so much to the local media who came out to support the show! Check out the story from the Utica OD and WKTV! For more information on this project, please keep an eye on our Facebook page! Geoff and Ryan of Utica Firefly have been hard at work with us these past eight months gathering footage for the Starting Over documentary. Check out this preview, and please join us for the film premier on Friday! 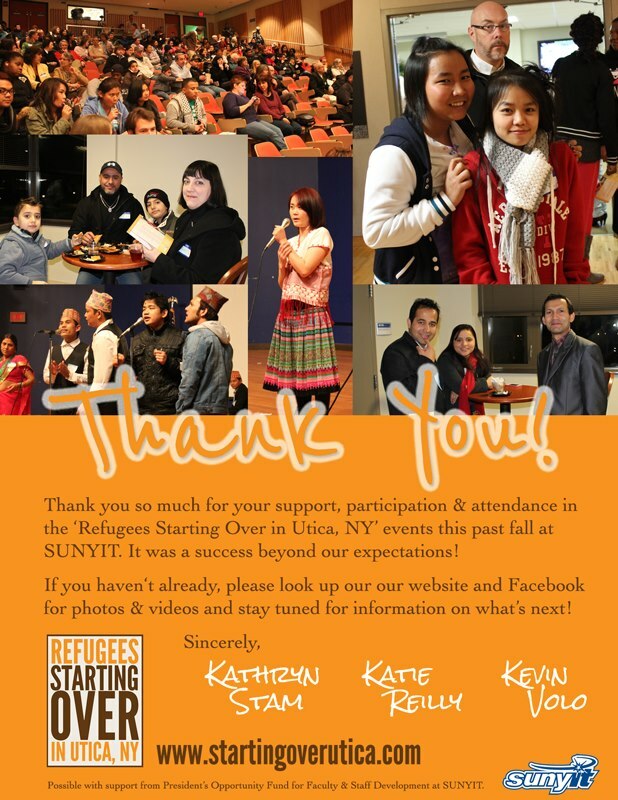 You are invited to attend the opening of the Collaborative Gallery Show “Starting Over: Portraits of Refugee Life in Utica, NY”, the premier event in the Refugees Starting Over in Utica, NY project series. Free and open to the public! Taking place at Gannet Gallery on the first floor of Kunsela Hall @ SUNY IT. 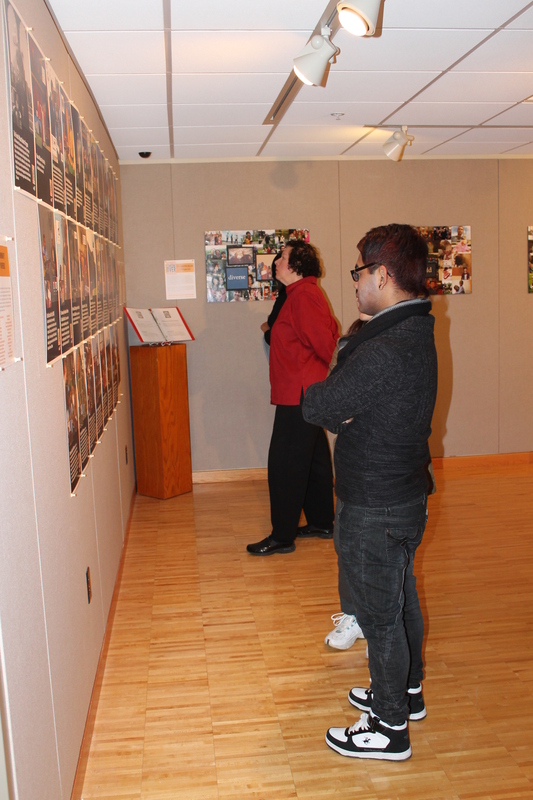 Click here for directions and campus map: http://www.sunyit.edu/directions/The Collaborative Gallery Show will feature contributions by students, refugees and many of the groups and individuals who serve the refugee community in Utica. It is curated by Kathryn Stam, SUNYIT Assoc. Prof. of Anthropology, Kevin Volo, SUNYIT Instructional Technologist, and Katie Reilly, SUNYIT graduate student. The Starting Over documentary is being produced by Geoff Storm and Ryan Miller of Utica Firefly. The Utica Firefly was started in May 2011 by Geoff Storm and Ryan Miller to explore the art of storytelling, focusing on Central New York and culture and themes close to the heart of our community. A main portion of Firefly is the live event which has been hosted by local coffehouse/venue Tramontane Cafe, although it also includes recording stories of local interest. The second Firefly event on October 13, 2011 has held in conjunction with the UNSPOKEN Human Rights Festival. The Firefly UNSPOKEN event featured stories of refugees, resettlement, human rights, equal rights, terrible stories, happy stories, and stories that made me want to laugh and cry. One different feature of this particular Firefly were that non-locals participated; filmmakers and participants of the festival shared their stories as well. Last May, in a small village in Chin State, Burma, there was a graduating class of six. Five of those were Bawi’s cousins. Bawi was able to start a new life for himself in Malaysia, and now is finally getting the education he desired in America. This story, along with other UNSPOKEN Firefly stories, can be found on the Utica Firefly Live Events website. Firefly has created a unique way of sharing stories of Starting Over. I look forward to seeing what stories of resettlement are to be shared throughout the project. 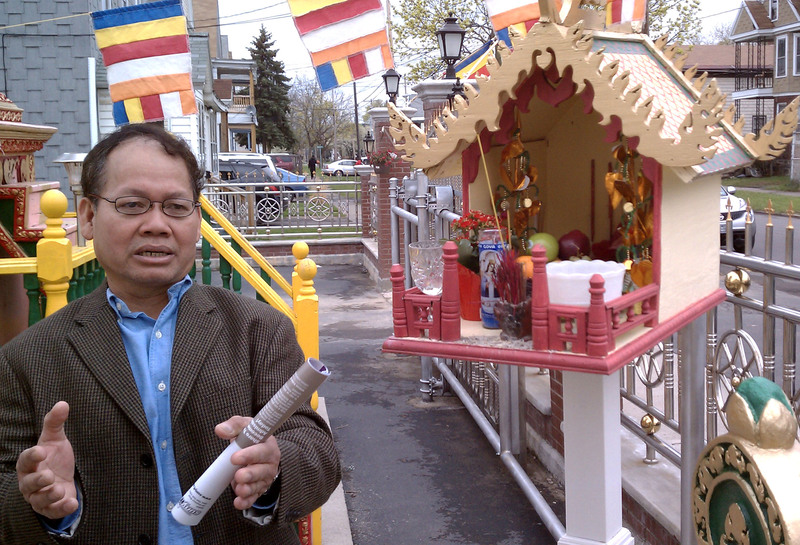 Sunday, April 15th was the last of a three day celebration of the Cambodian New Year Celebration. Some of the Starting Over team members went as a way to get the project jump started. 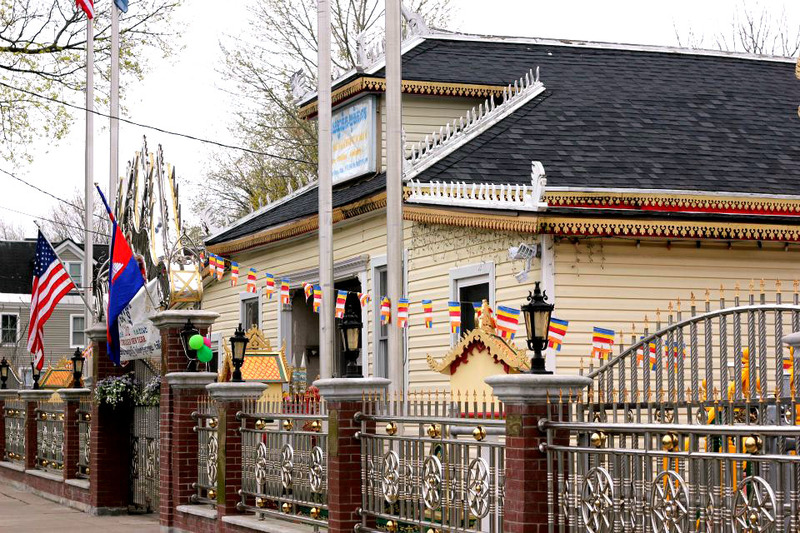 We arrived at the Khmer Buddhist Temple of Utica at 10am to an already packed house, with carloads of families arriving by the minute. Most carried in trays and trays of food. We snapped some photos of the amazing architecture before making our way inside. It was clear that we were outsiders, as if our hesitation didn’t give us away. However, we were greeted with smiles, nods and wishes of Happy New Year. The celebration started with traditions of donations to the Temple and the monks by the community. Each donation meant cleansing and good karma! There was a period of prayer time. 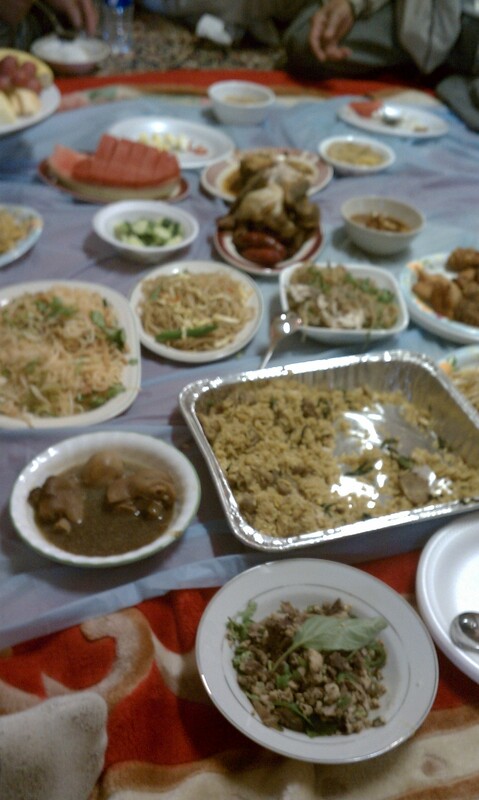 Then came the feast! The monks ate until they were full, then the remainder was shared among community members who sat in small groups on the floor. We were welcomed into a circle and shared some delicious food. Fresh fruit, traditional noodle dishes, meats and more. We were able to speak with people about their experiences in Utica, many of whom were happy to share their stories. Starting Over’s visit to the Cambodian New Year at the Khmer Buddhist Temple was very inspiring. The community was extremely welcoming and genuinely happy to celebrate with us, their new guests. I look forward to working with the community members more as this project evolves!